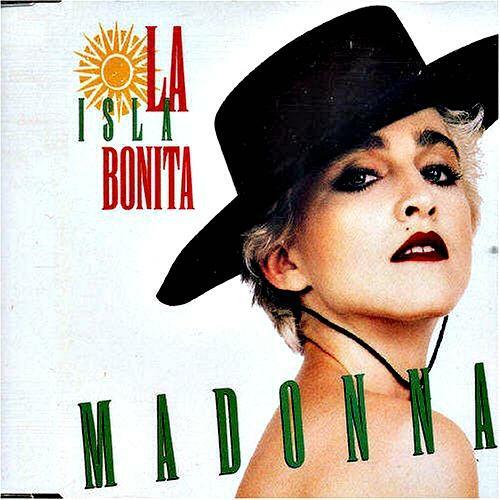 "La Isla Bonita" (or "The beautiful island" in English) spent two weeks at No.1 in the UK from 25th April 1987. It was a world-wide hit and was the last single to be released from Madonna's third studio album True Blue. Amazingly, the song was originally turned down by Michael Jackson for his Bad album. Madonna accepted the song (obviously!) but re-wrote the lyrics. An array of different Latino instruments can be heard in the song including Spanish guitar, Cuban drums and maracas. Both real drums and a synthesized percussion track are used. The four other singles from the True Blue album were Live to Tell, Papa Don't Preach, True Blue and Open Your Heart, and they were all Top 5 hits in the UK. True Blue remains my favourite Madonna album, mainly because every track is a perfectly constructed pop song and wasn't destroyed by thumping dance beats. 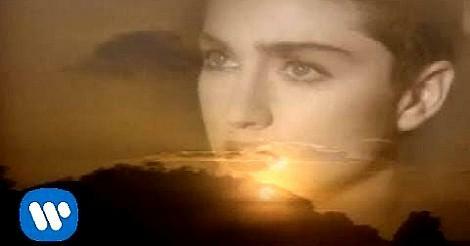 In the video, Madonna plays two characters - a devoted catholic girl and a passionate Latina, and she wore a red flamenco style dress for the second character. It was directed by Mary Lambert who also directed the controversial Like A Prayer video, as well as the for Like A Virgin and Borderline. The first airing of the video was on 29th March 1987 on MTV. Now, when Madonna sang the opening line "Last Night I Dreamt of San Pedro", as a teenager, I always used to think that this was the name of her lover! Of course, it is, in fact, the name of a stunningly beautiful town on the island of Ambergris Caya in Belize, Central America. However, there are sources that suggest the song was written about a fictional Spanish town named by Patrick Leonard, and that it is pure coincidence that there happens to be a town with the same name. Both Leonard and Madonna co-wrote and co-produced the song, with additional songwriting by Bruce Gaitsch. "La Isla Bonita" entered the UK singles chart at No.5 on 29th March 1987, while Ferry Aid was at No.1 with the charity single "Let It Be". By 19th April, Madonna was topping the chart, replacing Ferry Aid which fell to No.4. The single remained on top for two weeks, preventing Judy Boucher from reaching No.1 with "Can't Be With You Tonight". Interestingly, that song was still at No.2 on 10th May, when Madonna had fallen to No.7. The 7 inch vinyl single included a 4:20 Instrumental Remix. The 12 inch vinyl featured an Extended Remix (5:28) and an Instrumental (5:14). Don't miss this bonus 80s Megamix!